Very good! 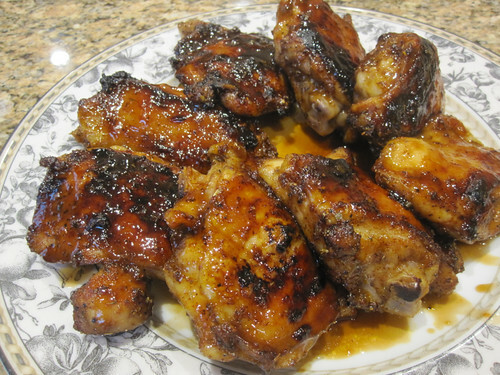 I used thighs and broiled in the oven, I will make this again in the summer on the BBQ. Be sure to use the glaze. It is rubbed with a easy and fabulous spice paste and then basted with a tangy honey glaze, I am sure on the grill it would give this a double dose of flavour, and easy to double for a summer BBQ. 1 tsp. chopped fresh oregano, I used 1/2 teaspoon dried. 1 whole chicken, butterflied, patted dry or 4 legs and 4 thighs. In a small bowl, mix the olive oil, salt, chili powder, paprika, brown sugar, oregano, black pepper, chipotle powder, and garlic. Rub all over the chicken and between the breast meat and skin. Cover and refrigerate for up to 24 hours or let sit at room temperature for 30 minutes. Set aside 1/4 cup of the honey glaze for drizzling over the cooked chicken. Heat all burners of a gas grill to medium low. Brush the grill grates with a stiff wire brush and then wipe with a lightly oiled wad of paper towels. Set the chicken, skin side down, on the grill, cover, and cook until it’s nicely browned and easily releases from the grates, 5 to 10 minutes. Watch carefully during this stage and if a flare-up occurs, move the chicken away from the flames until they die down. If necessary, squirt the flames with a little water to quench them. Spoon a teaspoon of glaze on each piece. Turn chicken and glaze again, don’t forget to save 1/4 cup of glaze for drizzling over the cooked chicken. In a small bowl, mix all the ingredients. Set aside 1/4 cup of the glaze for drizzling over the cooked chicken. I made this for supper tonite. It was good. Lenny said it was good. I keep comparing the the maple chipoltie chicken and nothing compares to that recipe!! so glad you love this recipe, did u do it in the oven or the BBQ?